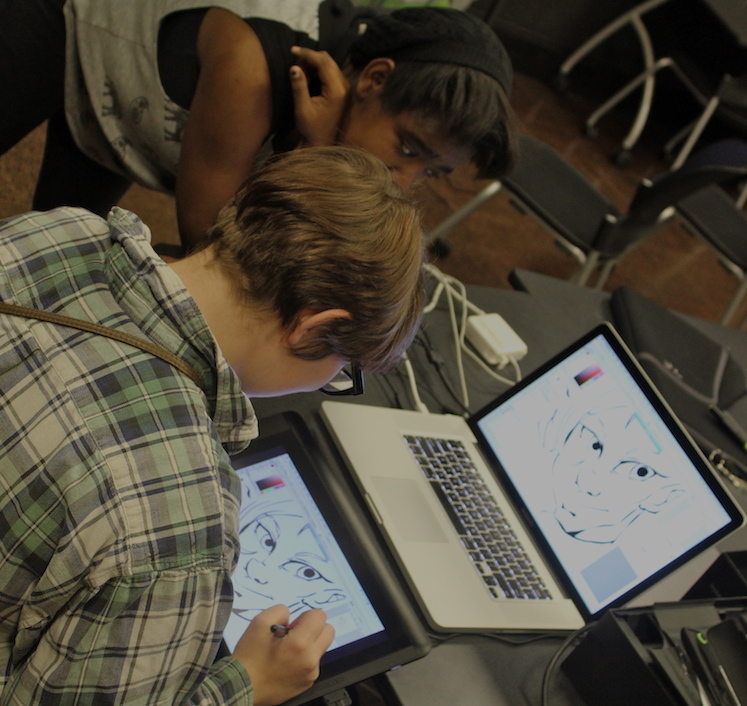 Aniya Anderson-Wilson is one of the newest teen mentors at Columbus Museum of Art, and is also an alum of the Surge teen program, a citywide free drop-in program designed for teens to experiment with technology, and hang out with other young creatives. Aniya is an artist and illustrator, and over the course of her years as a teen in Surge, Aniya became a natural leader. So, when she graduated from high school last May, she was offered a position as a mentor at CMA’s Teen Open Studio, one of six programs that are part of the Surge network across Columbus. We sat down with her recently to talk about her role as a Surge-teen-turned-mentor, her studio practice, and what is special about Surge. What exactly do you spend your time doing when you work in the studio? Usually when I come in I try to stay focused. I’ll come with a set goal in mind, like I want to start designing a particular character. It’s not anything serious, just a task I set for myself, but I would come here to do it and socialize with my friends, get their input, and wind up with a collection of ideas. Has anything surprised you about the experience during your time here? In what ways do you think Open Studio has benefitted the individuals who attend? Teen Open Studio is such a big difference when compared to school and I think that’s the main part that has kids coming back regularly. The fact that we get to share and work off one another really does help. For instance there will be instances where a friend of mine doesn’t know how to work a program, so I get to teach them. But then they point out something that I didn’t recognize because I don’t think like that person. Teaching someone how to do something, in itself, is almost a better way to learn that thing. For the individuals who attend regularly, or have visited multiple times, have you seen progression in their work? Just from an example standpoint, I’ve seen a lot of progression from the teens who work in the sound booth. I’ve seen in their interactions between themselves and Andre (another mentor and music producer) communicate better. They can discuss certain things and go from “I have an idea” to execution. Seeing not only the stages of their work but how it progresses step-by-step is really interesting. What starts as an idea slowly becomes this final product and that’s really cool. What is the most memorable piece of art that you’ve seen someone make during Teen Open Studio? That’s a tough one. The first thing that comes to mind is recently one of my friends did a piece digitally for the first time, because I decided to hassle him over and over again. This was before I was a mentor so I wasn’t hassling a student I promise (laughs), but he was a friend of mine who was strictly traditional. He tried digital for the first time after I managed to get him to do it and he created this cool piece. I loved it so much, it told an interesting story, and it was just fantastic to see. What would you tell a teen who hasn’t been to the Studio to convince them to give it a shot? I think teens would want to come for above all else the community that’s built when you come here. Realistically, Fridays are the quieter of the two days for those who might be apprehensive. But even when there aren’t a ton of people here there is still life in the Studio. You get to play with new materials and you don’t have to pay for any of it. And who doesn’t enjoy being creative in a space where everything is free? Come meet Aniya, hang out with other young creatives, and make your mark at Surge Columbus! For more details about the Surge program visit www.http://www.surgecolumbus.org. SURGE is a collaboration between CMA, Columbus Metropolitan Library, Wexner Center for the Arts, TRANSIT ARTS and WOSU Public Media, and COSI and is made possible by a grant from Battelle. Next Next post: What is Wonder?